If MK Dons fans ever needed a reality check, it was this from Paul Tisdale - they will not be mounting a siege on Wembley this season. The undefeated start to life under Tisdale came to an abrupt end on Tuesday night at the hands of Bournemouth’s multi-million pound Premier League squad, losing 3-0 at the Vitality Stadium to see Dons out of the Carabao Cup. At the final whistle, Dons looked despondent on the field, disappointed in the manner of the loss, or at least the scoreline. But in truth, it was hardly a fair fight, nor a fair reflection. What it took to assemble Dons’ starting 11 made up barely two per cent of the £25m fee Eddie Howe parted with for debutant Jefferson Lerma in Bournemouth’s midfield. Former England midfielder Jermaine Defoe led the line and Ryan Fraser, fresh from scoring against Everton at the weekend, kept his place in the side. Dons, meanwhile, gave 19-year-old Oran Jackson his first start in two years at the heart of the defence and rested three key players. The difference was plain for all to see, and was a typical example of might over will - the perfect poster for why lower league clubs do not show the competition as much credence as they could. Lys Mousset opened the scoring with a neat bit of trickery to skip past Baily Cargill on 15 minutes before Fraser joined him on the score sheet seven minutes before the break, converting Jordan Ibe’s deflected cross for number two. 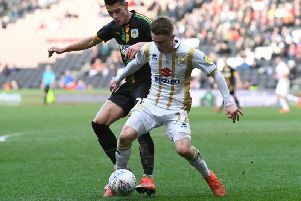 Lee Nicholls had recently admitted he was having a quiet opening to the season, but he earned his bread against Bournemouth, denying Defoe, Ibe and Lerma in the first half, while he had the bar to thank to keep Diego Rico’s freekick at bay. He would be eventually beaten again in stoppage time by Ibe, who deserved his goal, but there were precious few wounds to have salt rubbed into by the time the final whistle blew. “I think it was always going to be a tough game which ever team they picked,” said Tisdale afterwards. “Bournemouth have a large and talented squad which they showed in how they played and performed. “They’re quick, athletic and purposeful against a team on the fatigued side. “But we did really well, and I’m really proud of the players. Yes we lost and we’re a bit flat in the dressing room, but we’ve gained a lot tonight and I’m proud of them. In the immediate aftermath, Dons looked disappointed at the full time whistle, perhaps at allowing Bournemouth to score at the death, but there will be little hangover by the time they take to the road again on Saturday, destined for Swindon Town. Cliché though it is, league form is what will matter for Tisdale and Dons, not Carabao Cup encounters with top flight giants. Defeated on the night though they were, Dons are still one of four clubs to remain unbeaten so far in League 2 and if that is still the case on Saturday night, they will sleep far more soundly on the coach home.